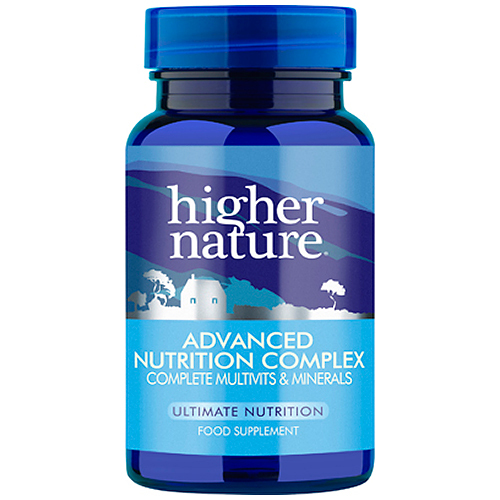 Advanced Nutrition Complex is a high potency multivitamin and mineral formula. It offers 24 key nutrients in their optimum organic form for better absorption and assimilation. The high quality ingredients in this product contributes to maintaining overall health, a healthy immune system and a more effective daily boost. 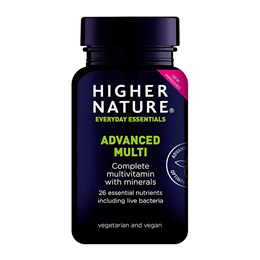 Advanced Nutrition Complex also includes trace minerals, such as Molybdenum, not normally found in other multivitamin products. Optimum forms for enhanced absorption. Complete and comprehensive daily supplement to suit most needs. Contains full B complex, antioxidants and important trace minerals. Contains Vitamin A – do not take if pregnant or planning pregnancy. Natural lithothamnion calcarea, calcium nitrate, magnesium citrate, calcium ascorbate, magnesium oxide, dl-alpha tocopheryl acetate (anti-caking agent: silicon dioxide), magnesium ascorbate, coating: hydroxypropyl methylcellulose, glycerine; colour: sodium copper chlorophyllin; ferrous gluconate, niacin (as nicotinamide), thiamin HCI, calcium d-pantothenate, riboflavin, choline bitartrate, anti-caking agent: silicon dioxide; zinc citrate, anti-caking agent: magnesium stearate*; inositol, retinyl acetate (antioxidant: dl-alpha tocopherol; anti-caking agent: silicon dioxide; emulsifier: sorbitan monostearate); manganese citrate, anti-caking agent: stearic acid*; pyridoxal-5-phosphate, l-selenomethionine (anti-caking agent: dicalcium phosphate); pyridoxine HCI, chromium picolinate, folic acid, copper citrate, phytomenadione, biotin, methylcobalamin, ammonium molybdate, potassium iodide, ergocalciferol. Adults and children over 15 years: Take 2-3 tablets a day. Children 11-14 years: Take 2 tablets a day. Children 5-10 years: Take 1 tablet a day, with a meal. This product contains iron, which if taken in excess, may be harmful to very young children. Keep out of reach. Below are reviews of Advanced Nutrition Complex - 180 Tablets by bodykind customers. If you have tried this product we'd love to hear what you think so please leave a review. I always use it, good supplement from reputable company. Does not have soya, very important for me as I can't have it.